FOR THE BUSINESS OF "YOU"
*Thank you for your interest in our deposit accounts. Do you live in Oregon or Southwest Washington? Thank you for checking to see if Lewis & Clark Bank can help your funds reach new heights. If you are located outside of Oregon or Southwest Washington, please call us at 503.212.3200 to customize a solution that best fits your needs. Discover the benefits of working with a local bank, where you can talk directly with an experienced banker who has the expertise to provide meaningful advice. Maximize your earnings and find flexible options for managing your personal finances with our checking and savings accounts. Contact us today to begin a conversation. DETERMINE YOUR FINANCIAL DIRECTION. Not only will you benefit from working with an experienced banker, with a checking account at Lewis & Clark Bank you get the tools to check your balance online, send out your bills and transfer funds between accounts, 24 hours a day, seven days a week. You also have flexibility to write unlimited checks and cash withdrawals can be made around the world. Fees for using any ATM in the United States are refunded to your account the same day. Contact us today to begin a conversation. TAKE CONTROL. Can .05% APY (Annual Percentage Yield) at a mega-bank really be called interest checking? Our tiered interest rates automatically maximize your earnings based on your account balance, so all you have to do is make deposits and write checks. With the same great tools as our Personal Checking, you earn interest on your balances while having the convenience to write unlimited checks and use our online banking around the clock. Cash withdrawals can be made around the world. Fees for using any ATM in the United States are refunded to your account the same day. View our deposit rates and contact us today to open an account. THE UPGRADE YOU DESERVE. A Trail Master 55+ account offers up to two account holders a rate increase of .20% Annual Percentage Yield over our current posted rates on certificates of deposit with terms of 6 through 24 months. Dont't forget, cash withdrawals can be made around the world. Fees for using any ATM in the United States are refunded to your account the same day. To be eligible, you must be 55 years-of-age or older. Call for details. SAVING FOR YOUR NEXT ADVENTURE. Whether it's your first trip or your 15th, we want you to be ready for your next expedition. A Lewis & Clark Bank savings account will allow you to start your savings plan and take advantage of our tiered interest rates, all while watching your nest egg grow. View our deposit rates and contact us today to open an account. FREEDOM TO GROW. If you want more freedom with your savings, then explore our popular Money Market deposit account. Get the benefit of tiered interest rates, so as your balance increases, so does your return. With this safe high-yield account, you have the flexibility of up to six transfers or withdrawals per statement cycle if pre-authorized, automatic, by telephone, computer, check or debit card. There is no limit to the number of transfers or withdrawals when made in person, by ATM, or for a Lewis & Clark Bank loan payment. Accumulate value and be free to do more with your money. View our deposit rates and contact us today to open an account. INTEREST RATES YOU CAN BANK ON. When you have time to invest your money over a longer period and want to avoid market volatility, you will benefit from exploring our fixed-rate Certificates of Deposit. For your peace of mind, our bankers have the expertise to maximize your FDIC insurance coverage. In addition, we offer competitive rates on all our CDs, so all you have to decide is how long to invest your money. View our deposit rates and contact us today to open an account. Unravel the mortgage process. Whether you are looking to buy your first home or your fifth, Lewis & Clark Bank can provide you with step-by-step expert guidance. Because nothing is more personal than "home", an experienced banker is a great resource along your journey. Contact us today to explore your options. Unique circumstances welcome. Lewis & Clark Bank has the resources to originate non-conforming residential mortgage loans. Whether you are planning a purchase, refinance, or custom construction over $417,000, we understand the specialized nature of these loans. Contact us today and we can walk through your individual plan. Cut through the jargon. Our focus is to understand your financial goals.Whether you are looking to lower your rate, make home improvements, consolidate debt, or free up cash for other uses, let us guide you through the process to find the best fit possible. Contact us today to begin a conversation. Tap into value. Lewis & Clark Bank has a variety of Home Equity Loans and Lines available. We have the expertise and resources to create the right solution for you. Handling the complexity of banking clients who are looking for a more personalized lending experience is our forte. Contact us today to begin a conversation. A successful business strategy requires effective management of available funds on a day-to-day basis. We encourage you to work with your Lewis & Clark Bank expert to determine the best banking strategy for your particular business. Contact us to discover which account combinations and deposit solutions will help take your business to the next frontier! Reach your financial objectives. For businesses of any size or level of complexity, our banking experts can find an answer to your deposit questions. Whether it's Business Checking or Account Analysis, not only will you enjoy the basics that any business would expect (online banking, check writing, and bill pay), but we have the ability to solve your time, location, and cash management requirements. Contact us today and see how our experienced professionals can find a preferred solution for you. Entrepreneurship rewarded. Discover a new level of earnings with a Lewis & Clark Bank interest checking account for your sole proprietorship while enjoying the same features as a regular business checking account. View our deposit rates and contact us today to open an account. An account with a name that embodies the spirit of Lewis & Clark to help you reach your financial objectives. For businesses of any size or level of complexity, our banking experts can find an answer to your deposit questions. Not only will you enjoy the basics that any business would expect (online and mobile banking, check writing, and bill pay), but we have the ability to solve your time, location, and cash management requirements. Contact us today and see how our experienced professionals can find a preferred solution for you. Saving for your next business milestone. What is your next business goal? This is an alternative way to separate your funds, while still earning interest with a fully tiered account. View our deposit rates and contact us today to open an account. Protecting the legacy of your business. Long-term vision? Our competitive rates and customized terms will assist you in maximizing your earnings. View our deposit rates and contact us today to open an account. Accumulate value without risk. This high-yield money market account is ideal for setting aside those reserve funds a business so often needs. As the account grows, our tiered interest rates assure that your account's Annual Percentage Yield (APY) automatically adjusts with your balance. View our deposit rates and contact us today to open an account. Safe keeping. This is the perfect account for local law firms that need to hold funds in trust for their clients. Our experienced banking professionals can provide you with all the details. Call us today. Community builders wanted. 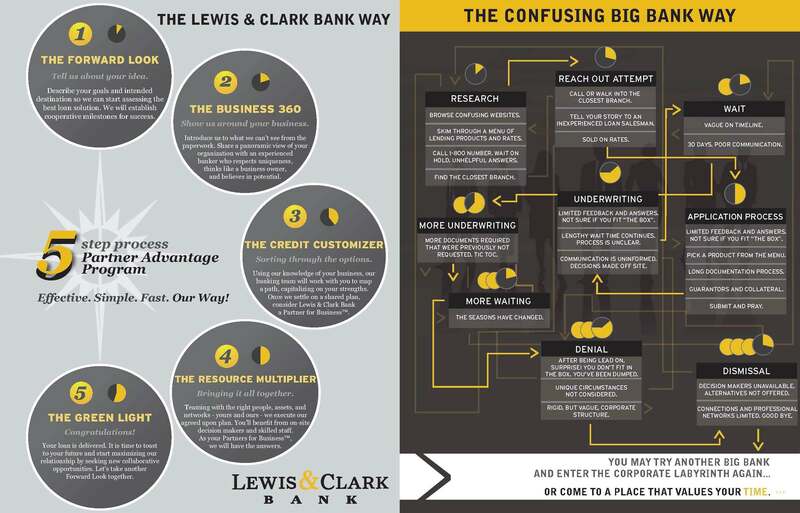 Lewis & Clark Bank has many account options for your unique financial endeavors. Please call us for details. Business lending solutions have many variables, and our approach at Lewis & Clark Bank is to make sure we understand your business and priorities. It's not just about paperwork, we actually want to see your business, your real estate projects, and your products. Contact us today to begin a conversation. Room to grow. Need to expand? Seeking a better location? It begins with you telling us what mountain needs to be climbed. Our expert lending team at Lewis & Clark Bank is ready to help you with your dreams of expansion and ownership. Contact us today to begin a conversation. If you build it... Even during the recession, Lewis & Clark Bank continued to work with construction companies and developers with the know-how to read the financial landscape and maintain success. It takes business savvy and experience to be successful in this competitive industry. Contact us today to begin a conversation. Staying ahead. Working capital is the life-blood of any business. Having access to funds can be critical to managing cash flow and expansion. Contact us today to begin a conversation. Explore possibilities. Have you found a new site and need to build or renovate? Are you looking to refinance your existing location? Is your business growing and in need of additional machinery and equipment? There are many Small Business Administration (SBA) loan programs available today that are well-tailored to small and medium-sized businesses. One such program is the SBA 504, which provides growing businesses with long-term, fixed-rate financing for major fixed assets, such as land, building, improvements, new construction, and/or long-term machinery and equipment. Because the down payment is typically as low as 10%, the SBA 504 program is ideal for businesses that are seeking to acquire fixed assets and preserve working capital. We have extensive experience with SBA loan financing and are here to work with you to develop a course that best fits your business goals. Contact us today to begin a conversation. Always room for improvement. Are you looking to expand your small business? Want to acquire another business? Needing to see some options regarding tenant improvements, leases, and/or inventory? Call our experts today to see if an SBA 7(a) loan is the right path for your business to take. Tools to succeed. Just like the machine that makes it all work, Lewis & Clark Bank can customize a solution for your business. Lewis & Clark has financed a variety of equipment and machinery in the local area that drive business. Give our lending team a call and start the conversation today. Ready to get started? Give us a call at 503.212.3200 or click here to download our interactive PDFs that best fits your needs.